HAPPY FATHER'S DAY TO ALL THE LOVING DADS OUT THERE!!! 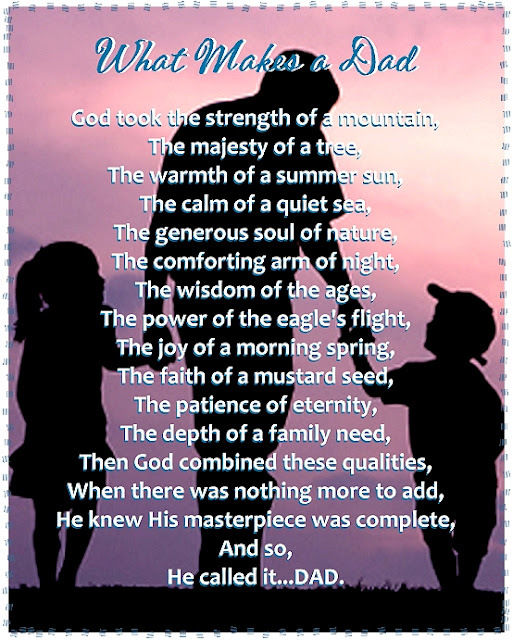 A real father is very rare….that’s why I've always felt so blessed to have one! No words can express how thankful I am to have a father who’s responsible, strong, smart and filled with love...a father who fulfills all his duties - to teach, to guide and to protect. I am the woman I am today because of the strong foundation he built. Now that I have my own family, I am so thankful to God for giving me a husband who's very much like my father. The first time Ryan held Clarise in his arms was so amazing to watch. I just quietly sat in the hospital bed watching them. Ryan is truly an awesome dad! From the day Clarise was born until now that we already have 2 daughters, he wholeheartedly accepts and performs the role of a real father. Never was there a time when he fails Clarise and Cherlin. 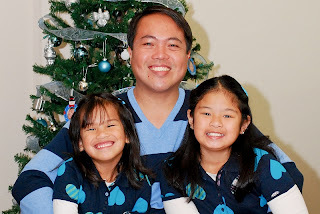 Each time I think of what a good father my husband is, I fall in love with him more. My father was one of the few great fathers and husbands of all time, and Ryan is right up there with him. Today, I celebrate these two great men in my life. What a blessing it is to have the best father and husband in the world! 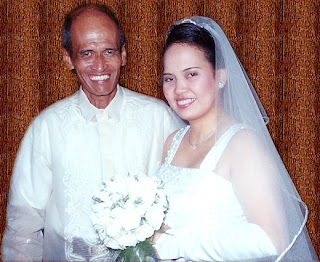 Happy Father's Day to my father, Ernesto Flores...and my husband, Ryan De Guzman! I love you both so much! If my father is here with us now in Texas, this is what I'll cook for him today. He loves anything with beef and pepper, so I'm sure he'll like this one. 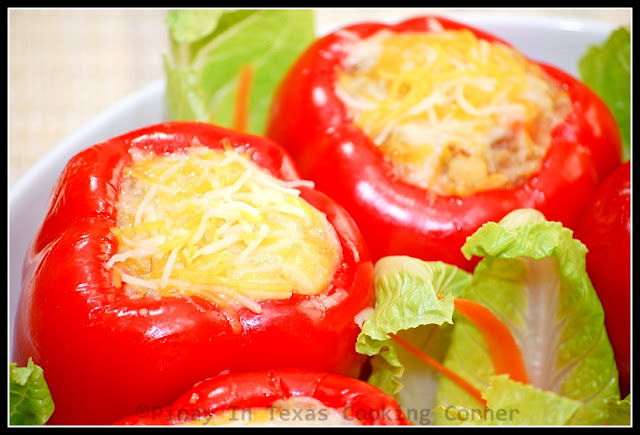 It was in April when I saw Chris of Gourmet Fashion's Oven Baked Stuffed Bell Pepper post. 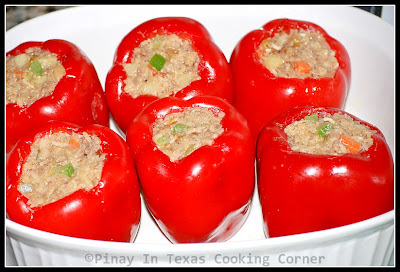 I got so intrigued by it and promised myself I gonna try making stuffed bell pepper myself. The other day, I got the chance to do it. Though I didn't follow Chris' recipe, I want to thank her for showing me through her post that making stuffed bell pepper isn't hard at all. Ryan and even the girls loved it! I'm sure it will be a hit to your family too! 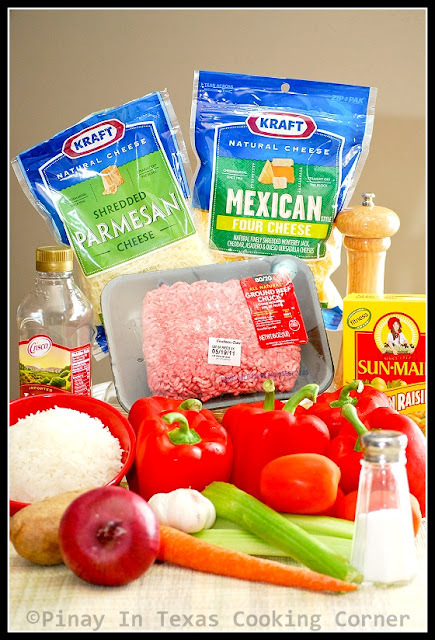 Just like what Chris said: "this is really so simple to make and ingredients can always be modified to whatever you happen to have on hand .. as long as the combination of ingredients works with the taste of the bell peppers you've got dinner in 30 minutes!" For Chris' recipe, click here. Here's mine. I'm sharing this on Savory Sunday and Yummy Sunday. 1. Blanch the bell peppers for three minutes in boiling water. Remove them from the water, carefully cut off the tops, clean the inside and rinse them in cold water. Set aside. 2.1. In a saucepan, sauté garlic in olive oil until light brown. Add onion and tomatoes and sauté until tomatoes are soft. 2.2 Add beef and sauté until juice starts to come out. 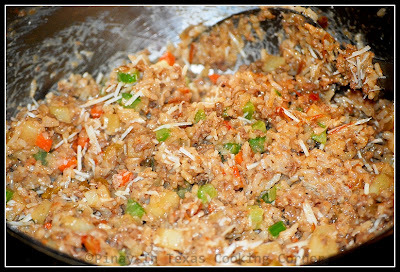 Cover and cook until ground beef is tender, about 15 minutes. 2.3 Add potatoes and raisins. Simmer until potatoes are cooked. 2.4 Add rice and carrots. Stir well until rice is heated through. Mix in the beaten egg. 2.5 Remove from heat and toss the Parmesan cheese onto the mixture. 3.1 Put the bell pepper in a lightly greased baking dish. 3.2 Stuff them halfway with the cooked filling. 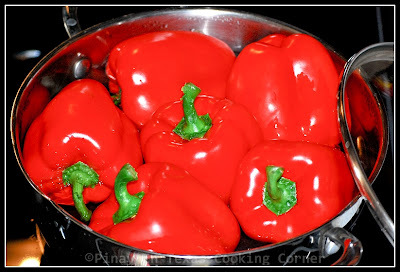 3.3 Add some of the Mexican four cheese into each bell pepper. 3.4 Stuff in some more of the cooked filling. 3.5 Cover each one with some more Mexican four cheese. 4. Bake for about 15 minutes. you are one lucky girl, you are blessed with great dad and a loving husband, yes it is rare. oh wow!!! this looks yummy but unfortunately, i don't eat bell peppers. i can probably eat the stuff inside...visiting from YS! hope you can drop by mine too! Yummy indeed. It is truly a blessing to have wonderful men in your life...Hope your husband and dad had an awesome father's day! Such a lovely, sweet and touching post Tina! You made me miss my daddy... who lives so far away too! sigh!! I love stuffed peppers! These look soooooo good, I wish I could join you guys for dinner! Nice! 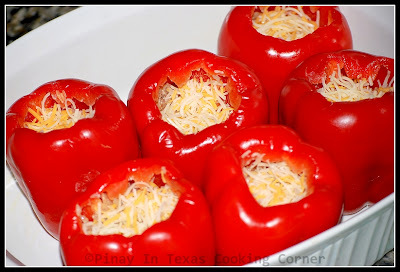 I love stuffed bell peppers! Yours look like mine only a little different :D I'll keep this recipe in mind and try it the next time. This looks divine. 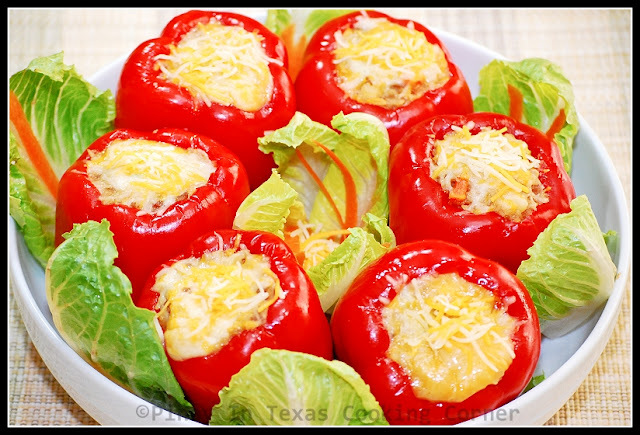 I haven't tried stuffed bell peppers but I find them quite sophisticated because it's baked. Hahaha! I really should learn how to bake. i recently saw this on TV. Thanks for sharing the recipe.